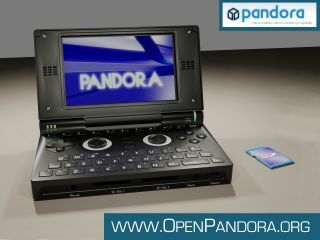 Project Pandora – the handheld gaming console concept that looks like a hybrid Sony Vaio P portable computer meshed with a Nintendo DS gaming console – is apparently not 'vapourware' after all, if a new demo video is anything to go by. While we await the March release of Gamepark's latest GP2X Wiz, it has all gone a little quiet on the Pandora front over the last few months. In the last contact we had with the developers before Christmas, they informed us that all heads were down as they tried to get the first batch of a few thousand consoles/handhelds manufactured and out to potential developers and homebrew fans. The concept and specs that we've seen to date are really all we've had to get excited about and – like many others – we had largely dismissed the entire project as 'vapourware' that would most likely never see the light of day, especially in a world dominated by harsh commercial reality. We've contacted the developers over at Pandora again this week, so stay tuned for further updates and (whisper it!) a possible release date! Head over to YouTube now for a look at the device.